Prague is home to one of the most revered classical music scenes in the world and is also renowned for its unique architectural tradition. On March 17th a group of about 45 Phoenicians attended the second annual Evening in Prague to learn about and experience both of these cultural features which make Prague one of Phoenix’s most unique sister cities. The event consisted of a presentation on Prague architecture by Akram Rosheidat followed by a performance by renowned Czech violinist Miroslav Ambroš and pianist Zuzana Ambrošová. Originally from Prague, Akram is one of Phoenix’s brightest architects. Earning his MA from the University of Arizona and his PhD from ASU, both in architecture, Akram currently works at MRT Design LLC. Akram also teaches classes at ASU as an associate faculty member of the university’s School of Sustainability. His expertise in architecture is evident in one the city’s most iconic buildings – the CopperPoint building located in downtown Phoenix which Akram and his team helped renovate. In his spare time, Akram is the chair of the Prague committee which aims to maintain and strengthen our relationship with our sole sister city in Eastern Europe through events like the annual Evening in Prague. 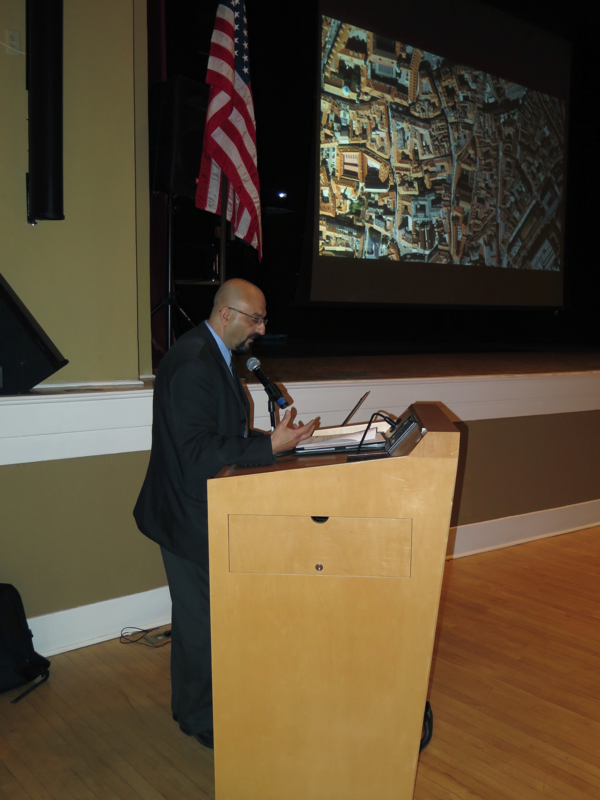 While the breadth of Akram’s presentation was truly impressive as it explored the history of Prague architecture from its classical roots to the present, his central thesis was clear: what most distinguishes architecture in Prague is its unique ability to captivate observers with an experience of mystery. Akram refers to this distinguishing feature of Prague architecture as the city’s genius loci – a Roman concept meaning spirit of the place. Through what might seem like endless layers of streets, courtyards, staircases, and steeples with pointed tops reaching for the sky, Prague provides visitors an experience of genuine mystery – one which might seem frightening at first but is nonetheless warm and inviting. After learning about Prague’s rich architectural tradition, guests attending the Evening in Prague were then treated to a performance by Miroslav Ambroš on the violin and Zuzana Ambrošová on the piano. The concert, lasting just under an hour, showcased the Czech tradition of classical music and left everyone’s ears tingling from sounds as beautiful as they were complex. At times, the music’s intricate structure of intensely fast pasted notes evoked feelings of excitement while other passages, slower and darker in tone, created an ambiance of mysterious tranquility. After the performance concluded, I had a chance to speak with Miroslav whose insight into the state of Czech classical music is quintessentially reflective of our central mission at Phoenix Sister Cities. According to Miroslav – whose technical training spans years of learning under, and performing alongside, the world’s top violinists from the Czech Republic, Canada, Germany, and throughout Europe – contemporary classical music in Prague has experienced a unique trend in the past five or so years. During this time, classical musicians in Prague have incorporated American influences into their music. Historically, classical music in the Czech Republic has been heavily influenced by the Russian tradition; but as more contemporary musicians like Miroslav combine this tradition with American style and technique, a truly unique and beautiful sound is produced. Our mission at Phoenix Sister Cities is to create precisely this kind of impact between the communities of Phoenix, Prague, and each our sister cities. Through genuine and intimate exchanges, we aim to ensure that not only do members of these communities learn more about each other’s’ culture and way of life, but that they are also able to incorporate the insights they learn into their own daily lives. Nick Karler is interning as the Assistant to the Vice-President. Nick is a senior at Arizona State University majoring in both philosophy and political science and is currently finishing his honors thesis for Barrett, the Honors College.